Value is the ability to do the work of change. If a thing can cause positive change it has value. Those things are called capitals. Capitals store value to do the work of positive change now and into the future. Capital is any store of value. Value is energy in business. Positive change doesn’t just happen. It takes work. Money or an asset that can be turned into money is one form of capital. The universal measure of equivalence between all capitals, the thing that all capitals have in common, is not money. It is the ability to cause change. Capitals can be divided into physical and fiat capitals. The value of a fiat capital depends on a human system. 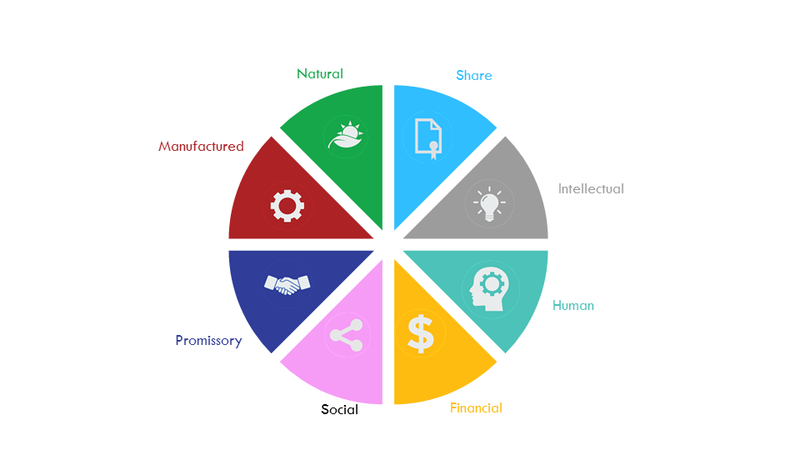 The work each form of capital can do is based on its unique properties and characteristics. Some exhaust through use. Others increase through use. The differential in value between capitals is what drives growth. Capitalisation means growth. Value is produced when one form of capital is transformed into another with greater value. The net result is more available value or energy to power the corporation. Capitals can be converted from one form into another. For example natural capital in the form of timber, can be converted using human and intellectual capital into manufactured capital in the form of chair. Capitals can be exchanged with stakeholders for their capitals. For example, the chair may be converted through trade into financial capital and depending on its price, quality etc also into social capital in the form of brand and reputation. Depending on the nature of the capital, a capital can be accumulated and stored for future use. Capitals do not spontaneously transform. A business model must be interposed between capitals in order to convert and exchange capitals. A business model describes the control, activity and resources systems required to transform capitals. Value is only created when capital is transformed into another form and the second form (the output capital) can do more work than the first (the input capital). The chair has greater capacity to do work than the the other capitals used in its creation. An efficient conversion/exchange of capital results in greater net value ie. the capital outputs are greater than the capital inputs (including transaction costs) measured in terms of value or capacity to do work. For example, in a successful research grant scenario there is more capacity in the resulting intellectual capital to do work than in the financial capital paid for that capital. A common mistake is to assume that a business model describes the logic of how revenues and profit will be generated. A business model designed to maximize financial capital will not necessarily create the greatest value. From a value perspective, if a business models transforms capitals with a greater value (work capacity) than money into money, the transformation is inefficient. The result is more money but less value. In practical terms, this means the business model is producing less capacity to do work in the future. This paradox is at the root of neoclassical economics. Rather that capitalize resources it leads to an overall decapitalisation. More money but less capacity to bring about positive change. A paradox that eventually leads to a value crisis. Grasp the theory of capital and capitalisation and it becomes possible to see the modern corporation is a positive light. The primary reason why corporations are the prime movers of capitalism is because, being legally separated from the capital of their stakeholders, the corporation’s entire existence relies on efficient capitalisation. To maintain and sustain existence, a corporation must create and accumulate surplus capital (capacity) through efficient transformation of capital. The formula for determining the efficient conversion of capital is value return on value Invested or VRoVI - capitals return (measured on a value basis) minus risk divided by capitals invested (measured on a value basis) plus Coasian transaction cost (the costs of transformation). A corporation that maintains a positive VRoVI produces the greatest value in the form of more capital if not the greatest profit. For the greatest profit may not store the greatest capacity to do the work of existence. A corporation that expends more value than it earns in return is doomed to fail. Corporations “feed” on the capital of stakeholders (and vice versa), receiving and accumulating capital and value in the form of financial capital, intellectual and social capital, and rendering back to the stakeholder by way of trade, manufactured capital with less value to the corporation than that imported. Thus enabling the corporation to exist and reproduce their own existence into perpetuity. Corporations are not money making machines, they’re are artificial forms of life. The greatest mistake made by business leaders is to believe that corporations were invented to make money for shareholders. This ignores the independent existence of the corporation and assumes that the legal form is just a way of organising the production of goods and services for the benefit of shareholders. This flawed assumption tends to lead to a negative VRoVI, better known as "short termism". A misguided belief that leads to the conversion and exchange capitals with a value greater than money into money. And then the transfer of that value to a shareholder for little or no return. Logically, the net effect of the belief is that the corporation has less capacity to do the work of sustaining its own existence. It’s the corporate equivalent of “cotard’s syndrome”. Capitalising their shareholders at the expense of their own longevity and very existence. The mantra of maximising shareholder value is, in energetic terms, a death spiral for corporations and, as it turns out, society. Neo classical economics is rooted in a form of madness. Contrast this with the belief that Corporations have existence and were granted this license by the state because when run according to the principles of efficient capitalisation nations are capitalised in the process. Guided by the laws of capitalisation a corporation’s best interest is to capitalise. Only decapitalising (turning things with greater value than money into money) as a last resort and even then, within the constraints of the law. Whether by design or mistake, the logic of corporate existence, leads to money being turned into capitals with more value than money. Efficient capitalization indirectly increases the value available to do the work of building civil society. Look what happened after the advent of the modern corporation in the 19th century. Human, social and intellectual capital grew exponentially as a by product of the corporation and its need to capitalise. Put another way, individuals and communities had greater capacity or energy to do the work of bettering their lives and the lives of others. Smith’s invisible hand is guided by a rational application of VRoVI. Conversely, inefficient capitalization decreases the value available to society leading to greater inequality. Look at what happened in the late 20th century when, under the influence of shareholder primacy, corporations started to turn things that had a greater value than money into money. Producing the paradox of more money but less value as the other capitals are run down and exhausted for short term profit. Starving communities of the capitals required to flourish. Originally devised by Stephen Bainbridge, a law professor from UCLA*, I’ve modified his hypothetical (changes in bold) to illustrate the importance of the three C’s. Should the old plant be closed? You can find my answer here.